Taking Down The Bird Feeder. Leave It To Maxine. Just have to luv Maxine. Taking down the bird feeder. This is the best analogy yet! Leave it to Maxine to come up with a solution For the mess that America is now in economically. I bought a bird feeder. I hung It on my back porch and filled It with seed. What a beauty of a bird feeder it was, as I filled it, lovingly with seed. Within a week we had hundreds of birds taking advantage of the continuous flow of free and easily accessible food. But then the birds started building nests in the boards of the patio, above the table, and next to the barbecue. Then came the poop. It was everywhere: on the patio tile, the chairs, the table…. Everywhere! Then some of the birds turned mean. They would dive bomb me and try to peck me even though I had fed them out of my own pocket. And other birds were boisterous and loud. They sat on the feeder and squawked and screamed at all hours of the day and night and demanded that I fill it when it got low on food. After a while, I couldn’t even sit on my own back porch anymore. So I took down the bird feeder and in three days the birds were gone. I cleaned up their mess and took down the many nests they had built all over the patio. Soon, the back yard was like it used to be ….. Quiet, serene…. And no one demanding their rights to a free meal. Now let’s see. Our government gives out free food, subsidized housing, free medical care and free education, and allows anyone born here to be an automatic citizen. Then the illegals came by the tens of thousands. Suddenly our taxes went up to pay for free services; small apartments are housing 5 families; you have to wait 6 hours to be seen by an emergency room doctor; your child’s second grade class is behind other schools because over half the class doesn’t speak English. Corn flakes now come in a bilingual box; I have to ‘press one ‘ to hear my bank talk to me in English, and people waving flags other than ‘Old Glory’ are squawking and screaming in the streets, demanding more rights and free liberties. Just my opinion, but maybe it’s time for the government to take down the bird feeder. If you agree, pass it on; if not, just continue cleaning up the poop. We human beings like to congratulate ourselves as being better than and above other creatures. Again and again, however, some non-human animals demonstrate nobility of character that puts humans to shame. Dogs are noted for their loyalty to their owners, but a shaggy dirty golden-colored dog in China shows his great love for one of his own kind. On the busy Dazhi road in China, a motorist struck a dog who died from his wounds. But his golden-colored buddy risks his life to look after his stricken friend, despite the cars whisking by, with blinding lights and blaring honks. The faithful dog stays put, standing guard to protect his fallen friend. Eventually, the dead dog was picked up by a passer-by, who buried him. Having seen the man carefully pick up his dead mate, the unhurt dog bounded off and was never seen again…. 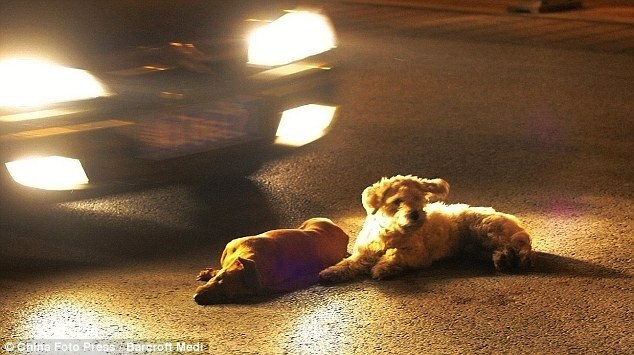 The faithful dog lies by his dead friend, who has been knocked over on the busy Chinese road. The cars give the pair of dogs a wide berth and eventually the struck dog is taken off the road. Jesus chose to be born to poor parents instead of kings, in a humble manger instead of a palace, and surrounded by humble barn animals instead of obsequious servants. St. Bonaventure (1221-1274) called animals “creatures without sin,” unlike we humans born with original sin or concupiscence that renders us “tinder for sin (fomes peccati).” I have no doubt, therefore, that Christ finds this nativity scene endearing.